Ops Leader—Vigilante Ethan Has Arrived! Whole new Vigilante system available right now! Vigilante ☆Ethan☆ available to be recruited! Being the center of a Crime Ops, Vigilantes not only contains powerful combat ability but can also provide awesome and powerful buffs to the Ops team. One of such Vigilantes is Ethan, although unstable mood from time to time but as an Elite Sniper Instructor he is capable of increasing all the Shooter’s [Attack by 10%] and [Defense by 10%]. 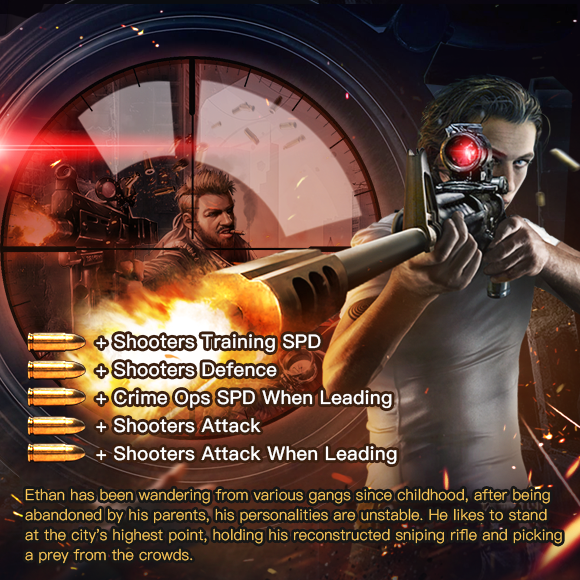 There’s more, Ethan can also provide attributes such as [Ops Speed by 10%] and [Shooter’s Attack by 30%] to the Crime Ops team that are under his command! Truly the “Most Dangerous Sniper”! Purchasing the “Elite Sniper——Ethan” Pack right now, will not only allow your unlock this Vigilante but also provide additional Star-Up Fragment. The pack also contains loads of Vigilante EXP that can be used to faster level up your Vigilante! Tip: This pack can only be purchased 12 times, and the Pack Tiers will not reset. ※Click on “Mansion”→ “Vigilante” to enter the “Vigilante Interface”, where Synthesizing and Advancing of Vigilante are done. Whole new ※Vigilante Skill Upgrade feature※, once Vigilante has reached the specified requirement, additional fragment can be used to completely upgrade Vigilante! Ethan’s ultimate skill can increase [Crime Ops Speed by 30%]&[Shooter’s Attack By 50%], when Ethan leads the Crime Ops!!! Strengthen Ethan with the -[Dead Shot—Ethan]- pack, which contains plenty of Ethan Fragment as well as loads of Vigilante EXP. A pack with containing everything you need to upgrade a Vigilante. Recruit your Ultimate Vigilante! Tips:Purchase now and you will also be able to partake in the “Gold Rebate” event, more info can be viewed in the “Event Center” within the game.